With all kinds of local summer fruit coming into season, the farmers markets are positively bursting with colour these days. It's a little overwhelming, the culinary possibilities, endless. And, to quote the lovely and talented Halifax food blogger Gateau Rose, "I want to make all the things!" While munching a delicious Pain au Chocolate from Boulangerie La Vendedeenne, I caught sight of ruby red cherries gleaming among checkerboard display of berries at the Elmridge Farms table. Easily distracted by shiny things, cherries quickly became my focus. Dessert would be a cherry and chocolate affair. Initially, I set out to make a black forest cake inspired pavlova, chocolate meringues layered with red cherry compote and whipped cream spiked with kirsch. But, there was a little incident in the kitchen which resulted in several slightly damaged meringues. Minor setback, the solution, Eton Mess! Not sure how this dish was first invented, but I bet it was someone in kitchen at Eton screwing up their pavlova too. It's composed of the same basic ingredients; crispy chewy meringue, and whipped cream layered with fruit, the presentation is a little less fancy though. 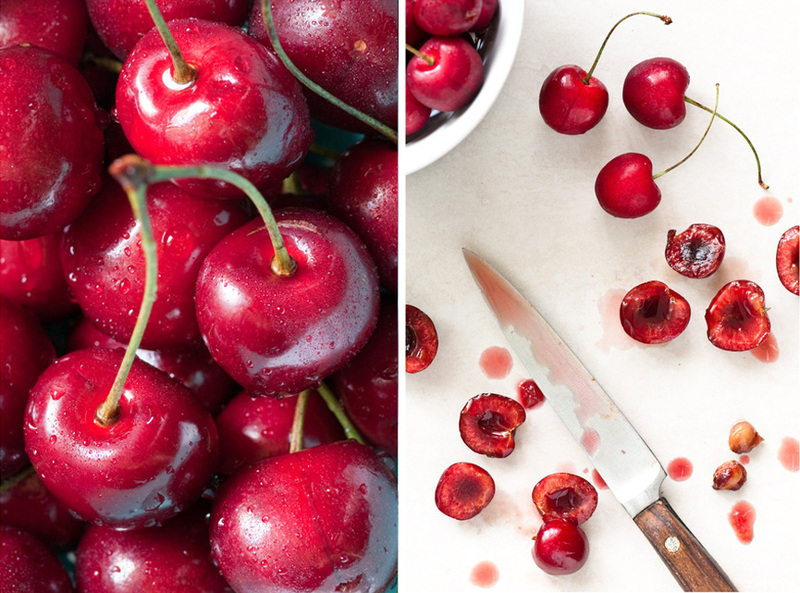 To make the cherry compote, simply remove the pits from a quart of red cherries, reserving any juice. 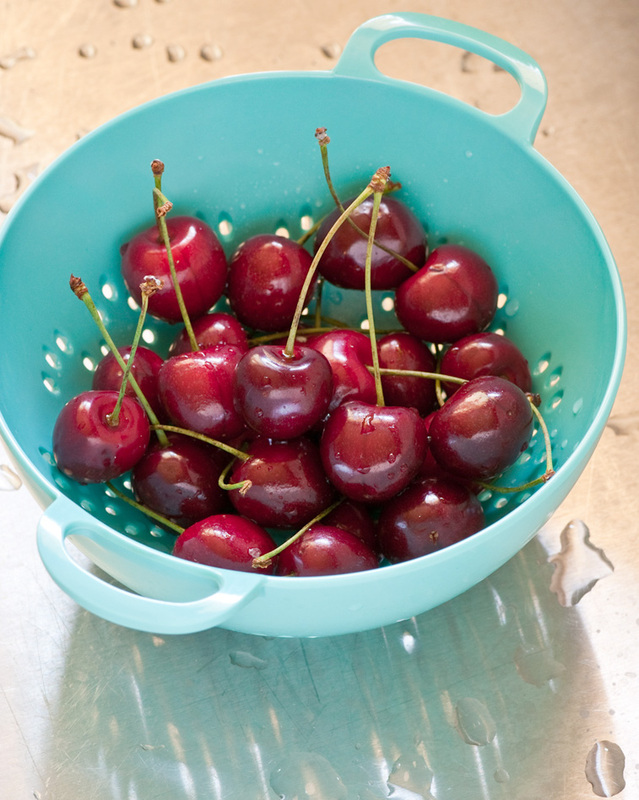 Combine the cherries and their juice with 1/4 cup sugar in a small sauce pan. Add two tablespoons of water to 1 teaspoon of cornstarch in a small bowl and whisk to combine. Add this mixture to the saucepan with the cherries and stir to combine. Over med heat, bring cherry mixture to a gentle simmer, and cook for 8-10 minutes until juices thicken slightly. Remove from the heat and stir in a splash of kirsch. Let cool to room temperature before using. Separate whites from yolks while the eggs are still cold, and let the whites come to room temperature before whipping. In a meticulously clean (grease-free) bowl, whip whites and cream of tartar on med/high speed until soft peaks form. Increase speed to high, and begin gradually adding the sugar, a couple of tablespoons at a time, until it is all incorporated and the whites become glossy and form stiff peaks. Sprinkle the balsamic over the whites and fold into the the mixture to incorporate. Then add the cocoa and chocolate bits and gently fold until there are no remaining streaks of white. Spoon mixture on to a cookie sheet lined with parchment into six mounded little rounds, about 5 inches across. Bake in a preheated 300F oven for 50 minutes. When the exterior of the meringues have formed a crispy shell, but the inside remains soft and marshmallowy, they are done. Turn off the oven, set the door ajar, and let the meringues cool slowly inside. This recipe will make 4 servings of Black Forest Mess. To assemble, first whip 1 cup of very cold whipping cream with 2 tablespoons of icing sugar until it forms soft peaks. Fold in a tablespoon or so of kirsch to the cream. Break the meringues into bite sized pieces and fold them into the whipped cream as well. 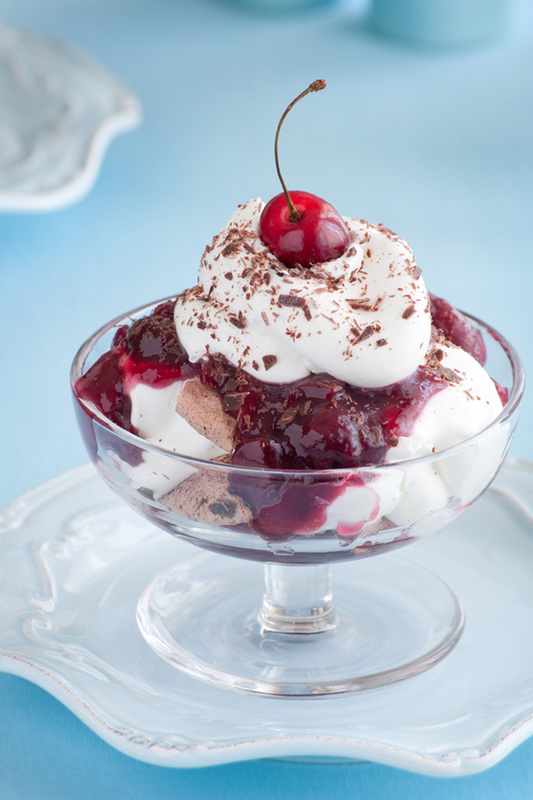 Start with a couple of spoonfuls of cherry compote in the bottom of your serving glass, then a generous dollop of cream and meringue, and top with more cherries and cream. Grate some additional dark chocolate over the mess to garnish. If you would prefer to make a pavlova with these flavours, just be sure not to drop a giant whisk on your pan of merigues, and follow the instructions of assembly here using the recipe above.